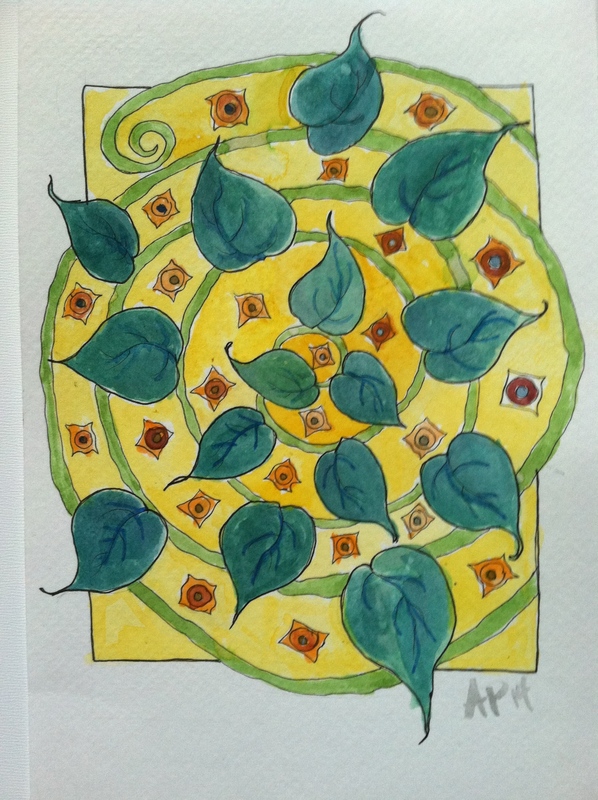 The theme for this week’s friendly art challenge was Mandala! I believe that most artists have a deep appreciation for mandalas, they are visually entrancing, calming and inspiring for most viewers. Their design can range from the spiritually traditional to the boldly modern. The term ‘Mandala’ is and ancient Sanskrit word that translates as ‘Circle’. Historically, the mandala was used as a means to ensure meditative focus by Buddhists and Hindus and was a representation of ‘The Universe’. 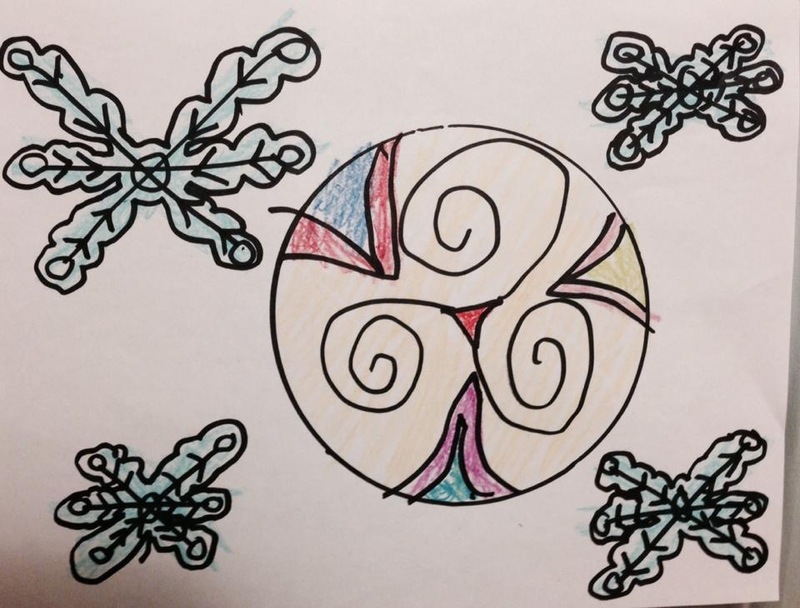 While there are plenty mandalas that display deeply rooted cultural traditions, there are unlimited possibilities in the making of a mandala. 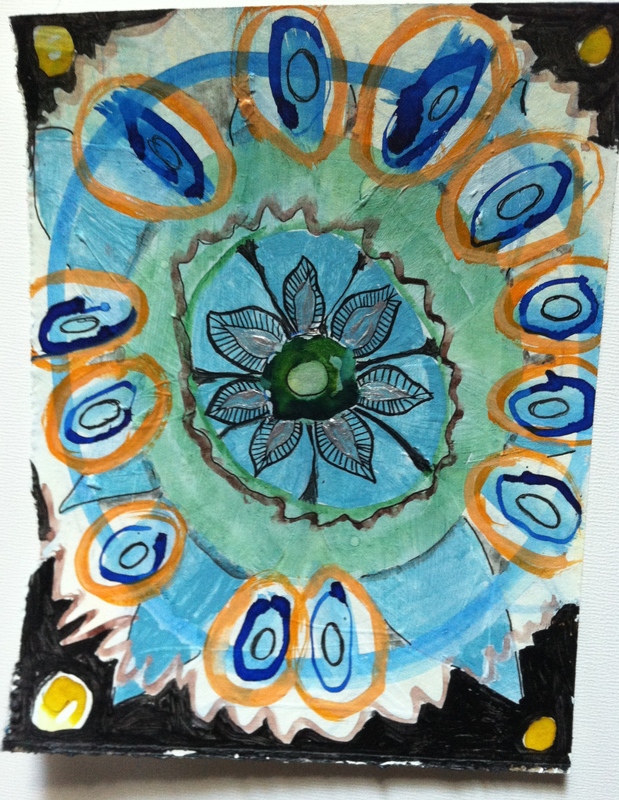 Mine: Mandalas with recycled books, watercolors, acrylics and ink – What I have always found most attractive about the Mandala was their varied purpose and design. They can be visually traditional and spiritually represent the Buddhist/Hindu vision of the universe OR they can be therapeutic and created intuitively with the intent of representing the individual’s inner self. One could create a mandala or one can simply look around and find hidden mandalas within nature, they are everywhere in the garden. 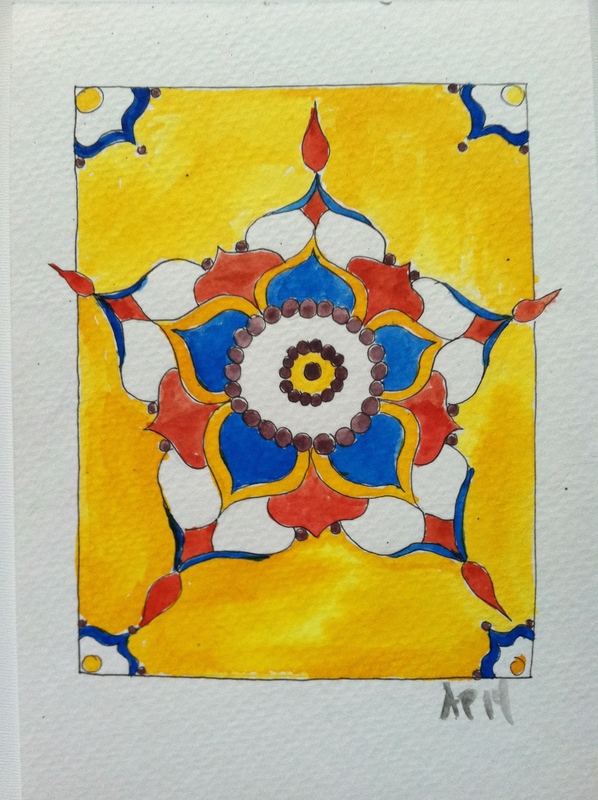 They are not necessarily symmetrical – though that is a common characteristic – but they always evoke a balance feeling. 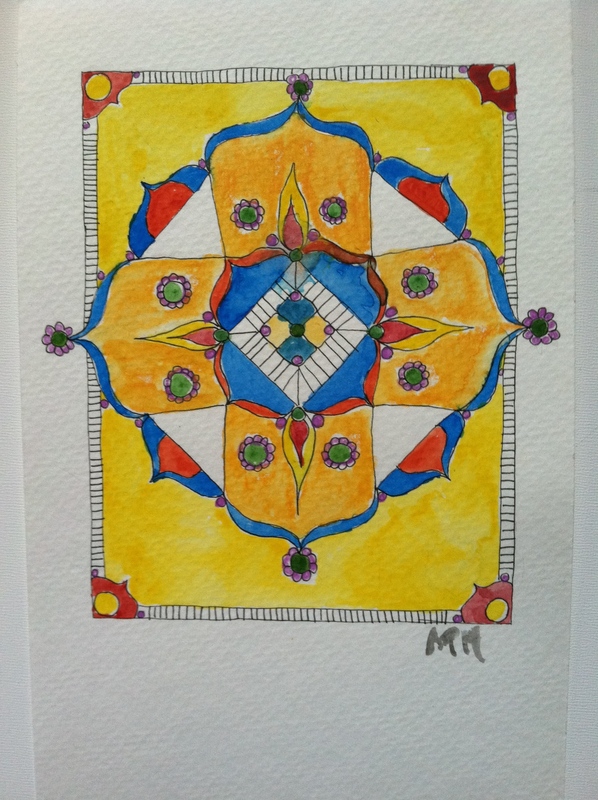 My mandalas were mostly created intuitively using various materials and therefore have a more abstract appearance rather than traditional. There were a few pieces where I had I challenged myself to focus more on the design, an I must confess that those turned out to be my least favorite out of the group – too much yellow and not very well executed, in my opinion. The first three represent the my more focused images and it was difficult to focus when I wasn’t really into them or having as much fun creating them. I wish I left them black and white, they bothered me less then. The second three posted are my favorite. I worked on them bit by bit over the course of a few days, whenever some inspiration would hit me and didn’t think about the end result as much, just had some fun! 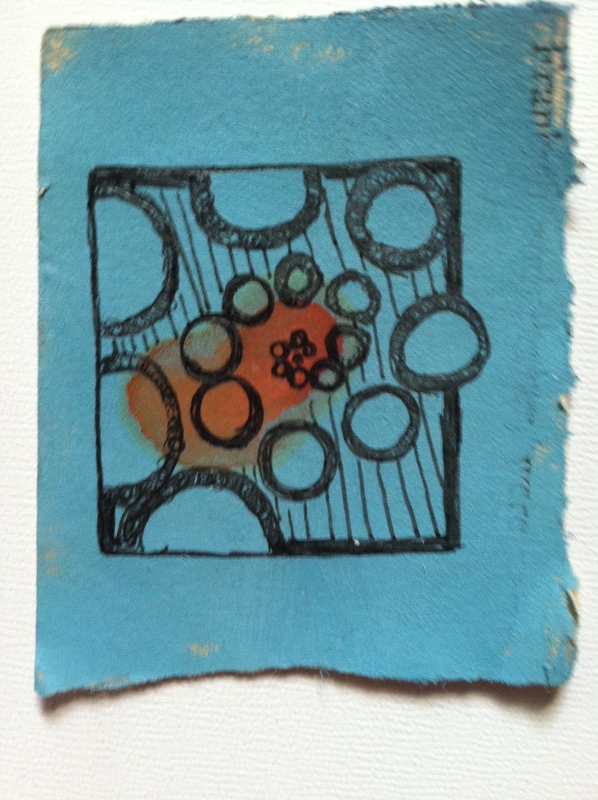 I used a variety of materials including gessoed and sealed pages from a decrepit 19th century book. The final three were doodles and sketches to get the mind flowing and work out some ideas. I still have some ideas in my sketch book that I want to work out and polish them up a bit. Next week’s them is : KLIMT! 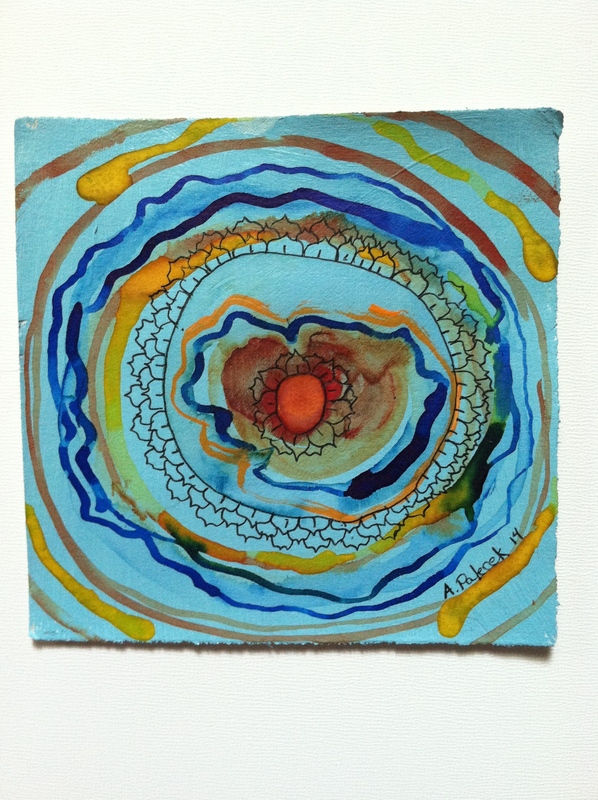 The theme for this week’s friendly art challenge is MELTED and I am super excited that we have a new participant! Rj’s very talented niece, Mikayla!! You are going to love her contribution! 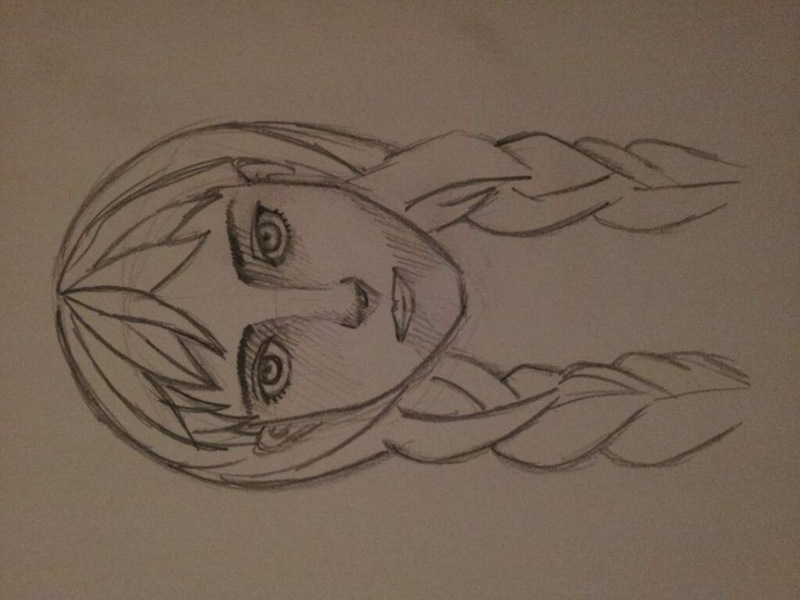 RJ’s: Frozen with pen. I love the glowing affect he achieved. 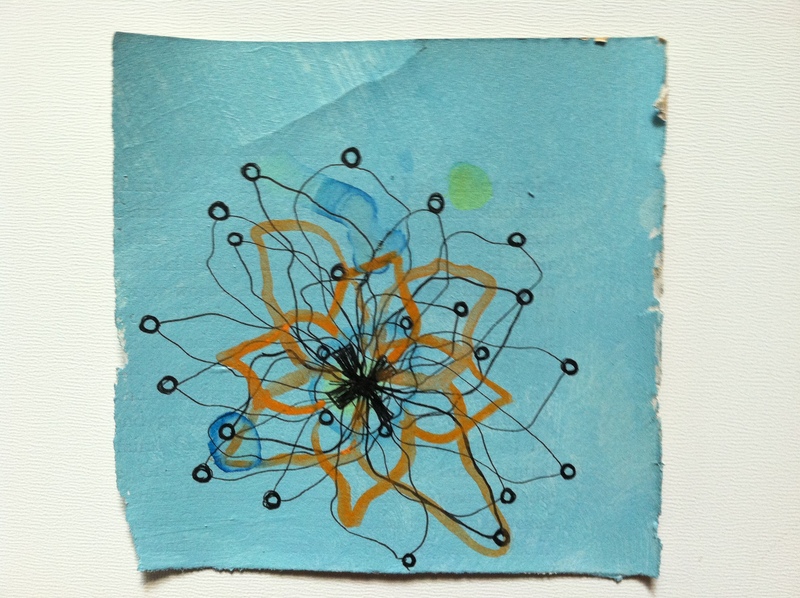 The piece was originally larger but he trimmed it down to the present size. 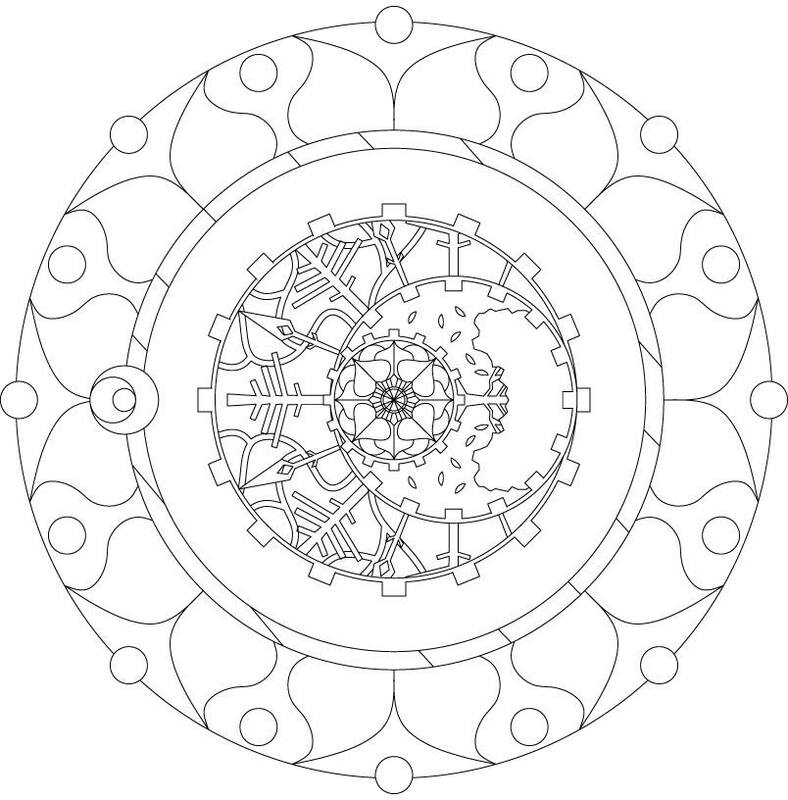 The original was to closer to the sketch seen below. I like that the finished product is focused so closely onto her face. The viewer then has to connect with her mournful violet eye and they must FEEL what she feels, and I do. I can feel the penetrating heat of a nearby fire and see its light reflecting off her skin as she thaws. 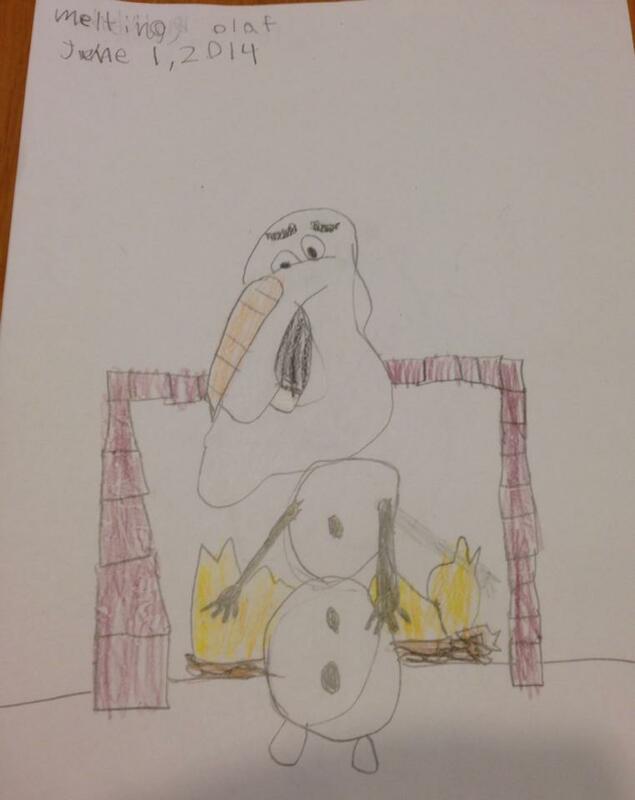 Mikayla’s: A Melting Olaf with pencil and crayon. I love how she captured Olaf’s jubilant nature as he melts beside the fireplace! Still wanting his warm hugs! She did a great job with Olaf’s face. I love the detail of the eye slipping behind the carrot, very clever. Can’t wait to see what she makes next week! 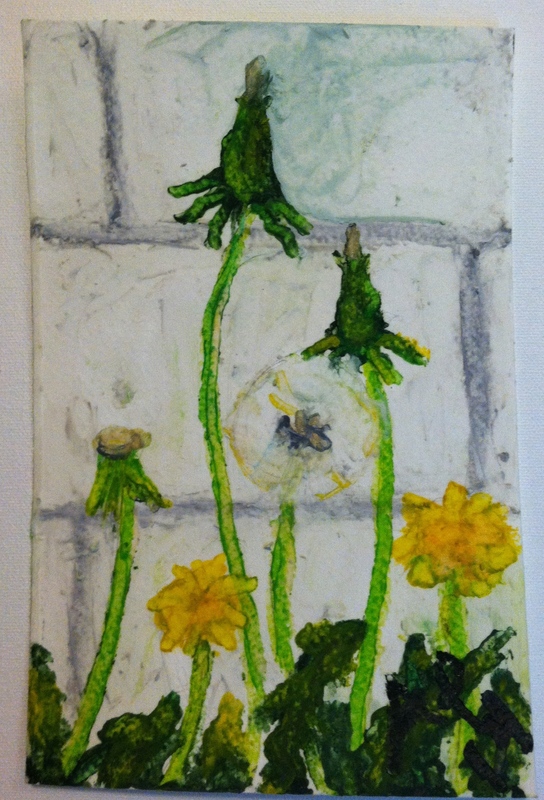 Mine: I’m sticking with the same subject, the magnificent Dandelion, and created my weekly art challenge images by melting some of the billions of crayons my mother has saved from the billions of boxes we have bought for my young nieces onto sheets of watercolor paper. lol, okay, we don’t have THAT many crayons; but, when you are fishing through a cookie tin loaded with purples and reds for the elusive yellow crayon, it certainly FEELS like a billion! 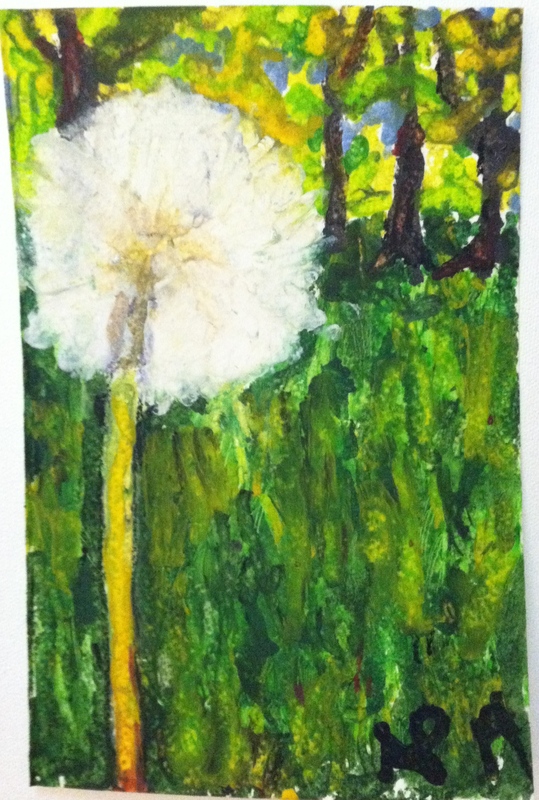 The first image, Dandelion Puff, took longer than the second image, Dandelion Crowd, to create. I burned myself several times with the hairdryer and may have melted some crayon into the carpet – oops! I did have a lot of fun creating them; which is the main purpose of this challenge, to have fun trying out new ideas! I think they both turned out quite well for a first attempt. 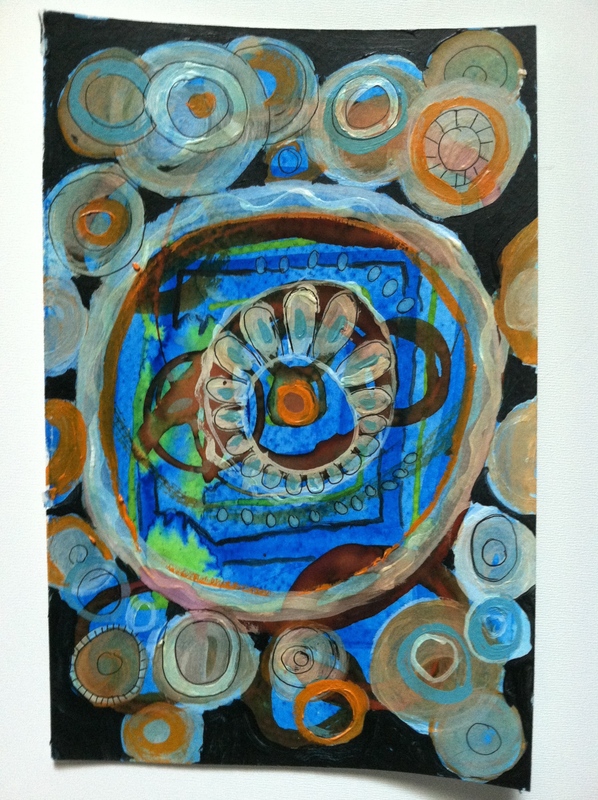 I may have to create some more and perfect my technique, already I am thinking of new ways work with melted crayons! !